I've gotten a few questions about this lately, so wanted to post briefly. I'm not a fonts expert, but I just copy fonts files into the Fonts folder on my computer such as Windows\Fonts and it works. Sometimes I need to restart OpenOffice.org or, if that doesn't work, restart the computer. 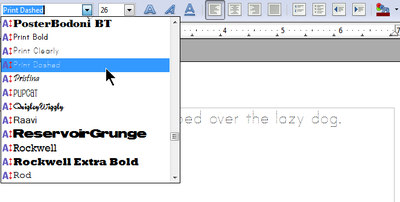 But OpenOffice.org does pick up the fonts you have on your operating system. If the font shows up in the list but doesn't look right or print, choose Tools > Options > OpenOffice.org > Fonts and check to see whether a font substitution has been set up. Check out a few free fonts, as well as fonts you can buy. 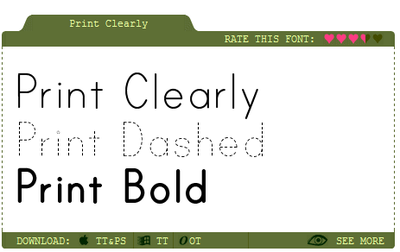 It has Mac Truetype and Postscript, Windows Truetype, and Opentype. For Windows, download the Windows font zip file, unzip it, and copy the contents (except the readme file) to your Windows\Fonts directory. For other OSes, it varies but a google will tell you pretty quickly. While I'm at it, here's where to get Microsoft's Truetype core fonts that you can install on Linux, as well as how to install them. Also, ironically almost exactly a year ago, I posted this blog on the font import wizard.